It’s been a little while since I last picked up my lovely collection of vintage crime short stories, “Dead Witness”, but I had a little lull between books recently and figured it was a good time to revisit! Time is progressing in the anthology, and the stories I’m reading now are from the turn of the 20th century. The informative intro to this tale gives a fascinating insight into author Sims’ life, and his detective creation, Dorcas Dene, is certainly an engaging one. Here, Dorcas is retained to investigate the case of a gentleman convicted of murdering his wife and confined to an asylum. His mother is convinced of his innocence and asks Dorcas to clear his name. An expert in disguise, she turns up unexpectedly all over the place, unrecognised by the narrator (who knows her well) and then finally explains all. Alas, experienced reader of criminal stories that I am, I got the solution almost immediately – which is no disrespect to the story, which I still found enjoyable and nicely written. 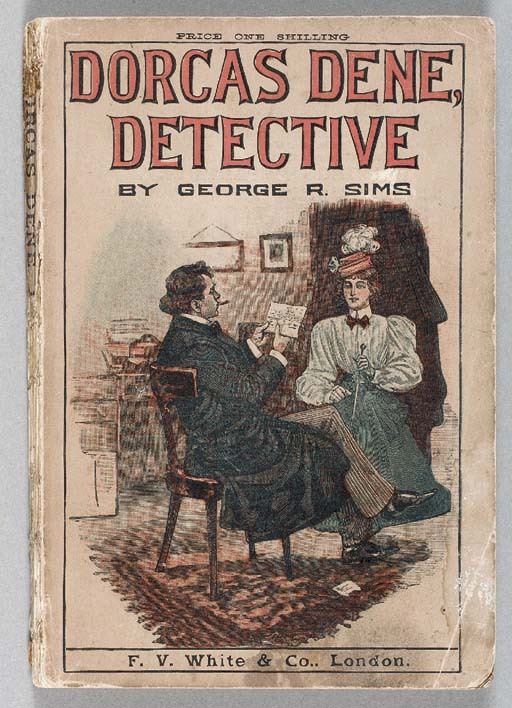 Dorcas is a lovely detective and I’d like to read more of the stories, as those with a female central character were still a rarity at the time. I’ll just have to try a little less hard to work out the plot…. The great detective Hemlock Jones features as the investigator in this story, and the narrating doctor is so convinced of his genius that he gets down and kisses his feet at one point. 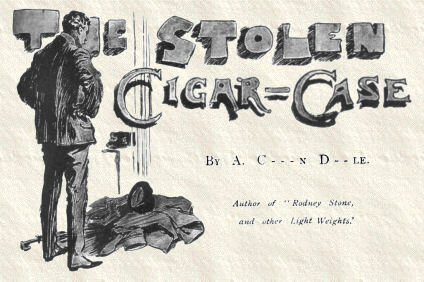 But Jones’s cigar case has gone missing and the tortuous processes of his mind bring him to a very alarming conclusion! The pastiche is brilliantly done, catching all of Holmes’s mannerisms and eccentricities to a T! Highly recommended if you love Sherlock and want a laugh! The Return of Vintage Crime Shorts! Yes, I have got a little behind with my reading of the short pieces collected in “Dead Witness”, but they were the ideal thing recently when I was between books and unsure of what I was actually going to read next. And the four tales I read were really varied – quite fascinating how different the short story can be. Though in truth, they’re not all short stories, as the first piece is an extract from novel – the one in which we meet arguably the most famous detective of all time, Sherlock Holmes! Reading Sherlock Holmes nowadays is never going to be the same experience as his first readers; so much of his image has permeated our culture that even if you’re not a fan, you know who Holmes is. And if I’m honest, Holmes didn’t really catch fire until the first short stories started appearing. 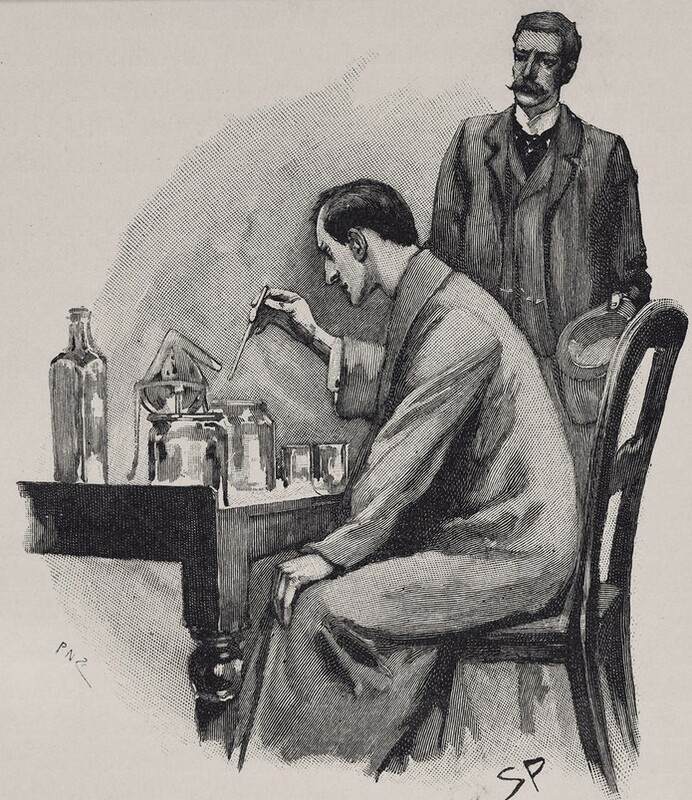 Nevertheless, editor Michael Sims has decided to feature the initial meeting between Holmes and Watson, which sees them setting up in Baker Street and also Holmes establishing his character and early signs of his deductive powers, so from that point of view it’s a good choice. It’s quite obvious that we’re in the presence of a great storyteller and great character, even in this early work, and I must admit that reading this had the effect of making me want to pick up my Sherlock Holmes short story collections and get lost in the world of Victorian crime. Truly, Holmes is the definitive detective! This section is a whole different kettle of fish, as they say. It consists of a selection of rather gruesome newspaper reports of the Ripper cases which were actually so graphic that I ended up skipping over some of the descriptions! It’s quite an eye-opener to see how the gutter press hasn’t changed that much, although this was probably one of my least favourite shorts in the book. The final story of the batch was a much more substantial and satisfying tale, write by Catherine Pirkis who was the first woman writer to create a woman detective – Loveday Brooke. Employed by an agency who can see the sense in having one of their number who can easily infiltrate big houses and the like, Loveday is sent to Troyte’s Hall to investigate the murder of old Sandy, the Cravens’ family retainer who lives in the lodge. The family itself is an odd one, with a reclusive patriarchal figure who spends all his time working, a daughter who has conveniently gone off to stay with a friend and a suspicious son who could well be the guilty party. Needless to say, Loveday manages to unravel things before the local policemen, although putting herself in danger in the process. But this is great stuff with proper detecting and quite exciting though maybe a little predictable! I’m now about two-thirds of the way through this book and it’s ideal for dipping into when you want a classic crime fix but haven’t got the time to invest in a novel – great stuff!! When I reviewed John Baxter’s “A Pound of Paper recently, I mentioned in passing the various lists in the back of the book – terribly dangerous for someone like me, always on the hunt for something new in the book line! I confess that the Ellery Queen lists of various classic crime stories and collections had a bad effect, and I may well have sent off for the odd penny book….. Ahem. Anyway, one of those volumes, The Triumphs of Eugene Valmont looked like ideal train-reading material, so it came with me on the journey to London recently, and proved to be very enjoyable! The Eugene Valmont stories are what he is remembered for nowadays, and my collection is a nice little Oxford Popular Fiction volume from some years back; it contains not only the eight Valmont stories but also the two Holmes parodies mentioned above. 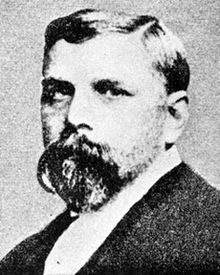 Of course, so much crime fiction was influenced and informed by Conan Doyle’s great creation that it’s often difficult to appreciate other works of that ilk on their own merits. However, these stories are more than able to stand comparison with Holmes and they’re a great read. Valmont introduces himself thus at the start of the first story, “The Mystery of the Five Hundred Diamonds”: The first tale covers the affair which led to Valmont being released by his French employers, and an ingenious story it is. The rest of the short works tell of club-footed ghosts, absent-minded men, lost jewels, kleptomaniacs and other entertaining plots. The character of Valmont himself is an engaging one – Barr manages to create a very convincing-sounding Frenchman, with the verbosity, gallantry and intolerance of British law and police that you would expect from one of our Galllic cousins of that era! He is susceptible to fine wine and beautiful women, and very occasionally you think that Barr might be hamming up the stereotype a little, but this is never so much that it distracts from the puzzle. And these puzzles are very good – from minor mysteries of stolen money to larger concerns of bombs and anarchy. Valmont’s cases stretch as far as America, and he is much more fallible that Holmes – he fails in some of his cases, and at times acts outside the law in a way that the resident of 221b would never do! Having struggled on occasion with short stories recently – particularly in fighting the urge not to rush through them and therefore not really retain them – I pleased to find that these were such an easy, enjoyable read. They’re well-plotted and well-written, and I think the issue I might have been having with the Amelia Edwards collection I started was the lack of continuity – with no common character or detective, each story is a separate entity. The tales here are individual, but with the constant thread running through of Valmont. In fact, the stories do stand as memorable on their own – while reading “The Absent-Minded Coterie” I was struck immediately by a sense of familiarity, and started anticipating the plot details. I dug about in an old Wordsworth collection of Holmes-era stories to discover that it contained this tale, and so I had read it previously and recalled the details. If you’re a fan of gentlemen detectives, period crime or Sherlock Holmes, this is really a book you should read. Highly recommended, and I wish Barr had written more about the fascinating Eugene Valmont! I’ve read all Mankell’s Wallander series and also all of Brandreth’s Oscar Wilde series, so both of these were well received. The Nicola Upson “Josephine Tey” books are new to me but I’ve been wanting to read them for a while as I love Tey’s books. However, OH seems to have presented me with book four, which is a perfect excuse to track down the other three….! I confess to being a great lover of Cath Kidston, and a wannabee-sewer so her “Sew!” book may come in handy! As for the cookbook – I’ve been vegetarian since I was 18 and have drifted in and out of veganism many times (always being seduced by damn cheese) – but I think my health would benefit from the shift back to veganism so this is a rather timely gift. As I’m a huge fan of Sylvia Plath, this book about her visual artwork is of course essential – very excited! Of course, I was lucky enough to see the actual Scroll on its recent visit to the British Library so I was very excited to receive this volume. I confess, it’s the first one I picked up from the lot to read! Thanks, lovely family! I do love the original Holmes stories and have read some offshoot books, so I’m hoping this will be good! Thanks, V! What about you? Were you spoiled this Yule?